You may be used to doing just about everything yourself—or trying to become an instant expert by reading the latest articles on the hottest subjects. Still, when it comes to your financial affairs, it may be more efficient and effective to work with a team of experienced professionals. Chances are that they can better guide you in the management of personal finances than you could by yourself. There’s a wealth of business, financial, tax, insurance, and estate planning experience readily available. Tapping into these resources is a matter of knowing who to look for and how to get started. A life insurance Agent is a valuable resource. There are many reasons why a life insurance Agent should be a key member of your estate planning team. A life insurance Agent’s job is more than just simply selling insurance and financial products—it’s much more. Help you to coordinate business and personal affairs. Your personal and business matters may be closely intertwined, and if that’s the case, they should be addressed simultaneously. Needs may include family decisions in business succession planning, estate planning and conservation, and retirement funding. Your Agent can help you decide on a program tailored to meet your financial goals. Conduct what is called a fact-finder. In the privacy of your home or office, a life insurance Agent can help you see where you are at this stage in your life, financially, and where you’d like to be in the future. Discuss financial products. Life insurance is not a one-size-fits-all product. 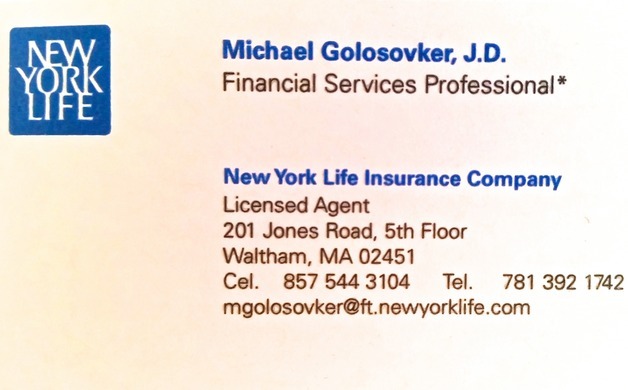 A life insurance Agent can explain the various types of life insurance and other financial products, and how they can be customized to meet your specific needs. Of course, the final decision will be up to you. Your life insurance Agent can serve as the “quarterback” of your insurance team. Life insurance Agents are trained to see the big picture and will be glad to cooperate with your other advisors in the creation of a professional team whose objective is to work in your best interests. At New York Life, we believe in and practice the team concept of estate planning. Our Agents will help you to evaluate your needs and provide solutions in concert with other team members. Talk to a life insurance Agent today.